Whether you're a boating novice, marine veteran or you just like playing around on the water, the London Boat Show is the perfect place to experience the best of the boating world. Bursting with new, exciting and interactive things to do and see, the London Boat Show is a celebration of our island nation featuring everything from seafaring skills through to boat design and coastal life. 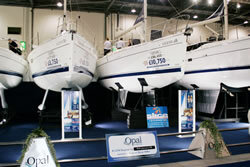 The London International Boat Show returns to ExCeL from 6-15th January 2012, celebrating 58 years of bringing the best of boating to the nation's capital. Come along and enjoy the thrill of being onboard one of the hundreds of fascinating boats on display; from historic replica vessels to the latest in marine technology. With over 500 exhibitors showcasing power and sail boats, dinghies, deck equipment, charter holidays, sailing courses and more, the Show will welcome over 135,000 people and promises to offer something for enthusiasts and first time visitors alike. 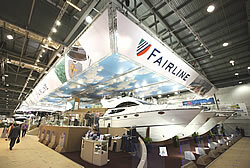 Following last year's success The Main Stage - Powered by Fairline will return to the 2010 Show. Visitors will be dazzled by theatrical shows, marine inspired catwalk collections, engaging seminars and much more running throughout each day. If you're more of a creative type, you'll enjoy seeing the winning designs from the Design a Sail competition, creating a wave of colour with Topper dinghies. This new initiative from National Boat Shows (NBS) will come to a climax at the London International Boat Show with the successful sails on display and the overall winner announced on The Main Stage - Powered by Fairline. Show visitors can explore hundreds of different world-class makes and models of boats from multimillion-pound motor-cruisers to one-man lasers and inflatable RIBS, and everything in between. From the makers of celebrity-style vessels to manufacturers of smaller craft like, visitors can climb aboard and experience any of the hundreds of the boats on display with specialist experts on hand to answer any questions. Experts from across the industry will be on-hand to help, educate and offer tips and advice on a multitude if boating related topics. Specialists ranging from finance experts through to sailing schools will make sure that visitors leave the Show armed with all the information they need. A range of interactive features will help visitors learn to anchor boats, use deck-gear correctly, navigate in fog, and maintain an engine. Youngsters can take their first steps into the sailing world by playing at the Deck Games area of the Show. The specially designed games will help them get fit for sailing, teach them how to hoist a sail and rig a boat as well as allowing children to race against each other in a variety of activities. Back by popular demand, the inland waterways attraction is a space for visitors to enjoy the best of our inland waterways. Canal boats, river cruisers and day boats will be moored on the attraction. This year, the London Boat Show has teamed up with Crocus to provide specially grown grass for the feature to bring an extra taste of the countryside. With over 700 exhibitors, around 1000 world-class boats and masses of related equipment, the London Boat Show is a must attend event for everyone with a passion for the water. The Show will be open daily from 8-17th January 2010 from 10am until 7pm (6pm Sunday 18). Thursday 15th is late night opening until 9pm. Adult tickets have yet to be arranged however children can come for free. 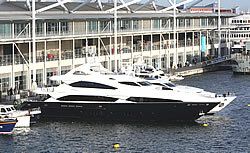 For more information or to book your tickets visit www.londonboatshow.com. 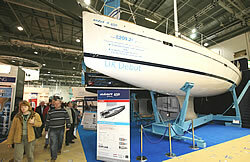 Visitors to the 2010 London Boat Show, are spoilt for choice with things to do, see and hear throughout the Show. Now in its 56th year, the Show promises to offer something for everyone and will welcome some 140,000 people. The new interactive Watersports Zone, in association with Mark Warner, the Para Academy, Jet Skier & Personal Watercraft and Sportsboat & RIB will challenge visitors to test their skills at one of the latest watersports crazes, kite-surfing. Adrenaline junkies will get the chance to compete against each other at this fun sport, in a safe, dry environment using one of the Show's exciting indoor simulators. Another opportunity to experience a unique sailing experience - without having to go anywhere near the water - is provided by the spectacular Volvo Ocean Race Simulator. This 3 minute ride will give visitors a taste of the dramatic race and feel the sensation of hurtling down huge waves in the Southern Ocean, breaking the 24 hour mono-hull record and finally rounding the infamous Cape Horn! Another 'must do' is Deck Games, supported by the Marine Leisure Association in partnership with Dinghy Sailing. Hoping to encourage young people to participate in boating, activities include a dinghy simulator from he Royal Torbay Youth Sailing Trust, rowing machines, a painting competition as well as a sail hoisting competition. Standing on a simulated deck with a real mast and sail, kids (of all ages!) compete to hoist the sail to the top of the mast in a race against the clock, with the best times recorded for all to see. 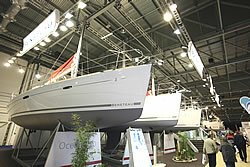 Visitors to the Show can discover how to start boating in a great new feature for 2008. Brought to you in association with All At Sea, it's the ideal place for anyone looking for impartial advice on how to take up boating. Visitors can learn from the experts about the different routes into boating; from the lower priced products which encourage entry level boating, to the more expensive options. This year, visitors can step foot onboard and explore HMS Exeter, the very first Royal Navy Destroyer to be present at the Show. The current HMS Exeter has a distinguished history, having served in the Falklands War (1982) and the first Gulf War (1991). The Type 42 vessel will be moored outside on the Show's marina in the Royal Victoria Dock and is truly an experience not to be missed! If it's a friendly spot of competition that floats your boat, check out the Show's very own Regatta, the Dinghy Weekender, on 19 and 20 January 2008. The exciting action out on the Royal Victoria Dock will include the Ovington Boats Musto Skiff Grand Prix featuring B14s and 29ers on the Saturday and the impressive Yachts & Yachting 'Battle of the Classes' Pursuit Race on Sunday. Plus there's the Carmela Cup during the first weekend, Thundercat demos for the first eight days and the Sunseeker P1 Race boats will be racing each day. Sponsored by Blue Water Supplies and Jersey.com and in association with Practical Boat Owner and Yachting Monthly, the crowd-pulling masterclasses in anchoring are extremely popular with everyone from beginners to skilled sailors alike. This eye-catching and educational feature simulates how to overcome frequently encountered anchoring problems. If older boats are more your thing, be sure to head to the Classic Boat feature, supported by Classic Boat magazine, Old Pulteney and International Paint, which will be displaying four superb examples of older craft this year. The oyster fishing smack Boadicea, the oldest working sail boat in the UK, will celebrate its 200th birthday at the Show. Meanwhile the Classic Motorboat Association will re-introduce its 10' 10" classic wooden speedboat, Colliwobble, first exhibited at the Show back in 1962. A superb offering from Jeanneau will include the all new Sun Odyssey 44i, 30i and the Merry Fisher 815. Beneteau to bring latest in MonteCarlo range to ExCeL The new Beneteau MonteCarlo is the latest in this popular range. Blue Water Horizons present the Aqualum 35 Making her Show debut, the Aqualum 35 features one of the largest flybridges for a boat its size. Launch of the Rinker 210 MTX C This boat will be making her UK debut at the London International Boat Show. Clipper marine to bring two new boats to the Show Clipper Marine will introduce the Bavaria 35, a world launch and Bavaria 47, a UK launch at the Show in January. Premier to launch new model at London Premier will launch the Moody 41 Classic at the Show this year, alongside three boats which made their debut in 2008. Princess will show their brand new V42, alongside the V85, 85 Motor Yacht and the 95 Motor Yacht which will be shown for the first time in the UK. Windy boats to exhibit two new models at the Show Two new models will be exhibited for the first time in the UK at the London International Boat Show. Visitors looking for something a little more affordable will find plenty of exhibitors with exciting products on offer. Garmin introduces two new VHF marine radios Garmin is pleased to announce the launch of the VHF 100i and VHF 200i, two new powerful VHF radios. Two new products from Marine Industrial Marine Industrial will be exhibiting their two new filler products at the Show. Hydronic M - new yacht heater from Eberspracher A new, innovative heater is being launched just in time for the London International Boat Show. The world's first practical capacity Lithium-ion battery This innovative new products will be on display at the London International Boat Show 2009. New 'touch' chart plotter on show at London International Boat Show Marine Electronic Services will be displaying their new innovative 'touch' chart plotter at the Show in January. Not only are there large boats, there's small boats, chandlery, and a multitude of marine accessories and equipment companies. From personal watercrafts to sailing schools and fashionable clothing brands such as Henri Lloyd and Timberland, there really is something for everyone!